Members of the Athabasca Chipewyan Nation speak at a protest outside a petroleum investors' conference in Calgary, Alberta. 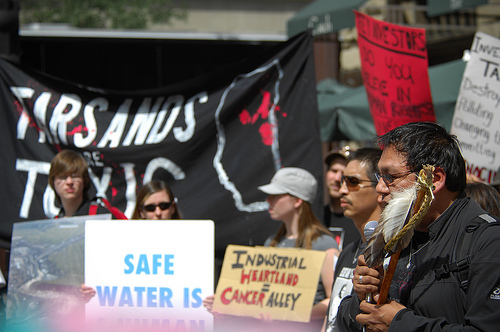 The protesters are opposed to highly lucrative development of oil sands in northern Canada, because pollution from the mining and processing of oil sands has been causing health problems for the mostly Native American communities who live downstream, without any consent from or compensation to the people affected. Human societies' decisions and practices with respect to the environment always raise the question of justice. For any way of relating to the environment, we can ask: is this policy fair to all the people affected by it? Some specific environmental justice questions that have been asked in recent years include: is it fair that polluting facilities are disproportionately found in neighborhoods of color, while parks are more likely to be found in white neighborhoods? is it fair that farmworkers are exposed to high levels of pesticides in order to produce cheap food for the rest of society? is it fair that indigenous people are expelled from their lands in order to create a sanctuary for endangered species? is it fair that standards of safety are based on the physiology and lifestyle of white cis men, not factoring in women's risks of breast cancer or indigenous people's higher fish consumption? Understanding environmental justice will give you an added perspective on many of the issues we have already studied. When there is contestation over cultural landscapes, when certain spaces exclude or include people according to their gender, race, or disabilities, when we use up resources, manage the commons, or choose a development policy, it is natural to ask what option is ethically right. Figure 1: Locations of hazardous waste sites in Detroit, MI, superimposed on racial makeup of the city. In the Detroit metro area, neighborhoods within 3 km of a hazardous waste site have populations that average 60.8% black, while neighborhoods farther away have an average of 18.5% black population. This is one of the strongest correlations between wastes and race in the country. The term "environmental justice" was coined in the 1980s by a loose network of poor communities and communities of color that were objecting to the location of hazardous waste dumps, polluting factories, and other locally unwanted land uses (LULUs) in their neighborhoods (Bullard et al. 2007), as shown in Figure 1. Activist efforts by these communities prompted scholars to begin conducting analyses to support or debunk the claims of unfair distribution of environmental harms and benefits. But questions of environmental justice go back farther than the term. The modern environmental justice movement draws on the U.S. civil rights movement (when Martin Luther King, Jr. was assassinated, he was in Memphis to support a sanitation workers' strike, which we can now see as a fight for environmental justice), turn-of-the-century urban hygeine activism by figures such as Jane Addams in Chicago, and resistance by indigenous people to the impacts of colonialism on their access to land and resources (Washington at al. 2006). Issues of environmental justice are doubtless as old as humanity -- we can imagine the people of ancient Mesopotamia arguing over whether a particular plan for building an irrigation network is fair to all farmers, and our hunter-gatherer ancestors debating what the correct choice of areas to burn would be. Questions of environmental justice can be separated into two related issues, substantive and procedural justice (Bullard et al. 2007). Substantive justice refers to the fairness of the outcome. This is sometimes referred to as distributive justice, because one of the most important substantive questions is how environmental harms and benefits are distributed among people. Most people would agree, for example, that it seems unfair that one small group of people should own all of the natural resources in a country, while everyone else has none -- unless some good justification could be given. Procedural justice has to do with the fairness of the decision-making procedure. Some people would argue that procedural justice requires that decisions be made by authority figures, such as a priest, king, or scientific expert. Others argue that the only just procedure is a democratic one in which all people affected by some policy get to have an equal say in the decision. Take, for example, the case of the creation of Great Smoky Mountains National Park (Taylor 2006). The land that was made into the park was not uninhabited wilderness. Instead, it was lived on by numerous poor, rural, white and black families. The federal government seized the land from these inhabitants to serve the goals of nature preservation and recreation. The former residents were originally promised that they could continue to live on the land, but the National Park Service increasingly limited economic activities that the NPS saw as harming nature or not being "rustic" enough. The former inhabitants of the park complained of both substantive and procedural injustice. Substantively, they said that the creation of the park violated their property rights and deprived them of the ability to make a living, driving them further into poverty for the benefit of tourists from far away. Procedurally, they said that they did not have enough input into making the decision to establish the park. A decision like that, according to their view, ought to be made democratically by the local people, rather than dictated by the government. Nevertheless, supporters of the park tried to argue that the creation of the park was both substantively and procedurally just. Substantively, they said that protecting nature from human exploitation and providing a recreational resource for the whole country was a greater good than the economic losses of a few people. Procedurally, they pointed out that the National Park Service was established by a democratically-elected Congress and President, and that one local interest group shouldn't be able to overrule the rest of the country. Numerous theories have been offered as to what counts as just or fair treatment of people. In this chapter we will survey five principles that are commonly referred to in the United States to explain why something is just or unjust: happiness, rights, equality, duty, and desert. These principles may conflict in certain situations -- for example, a policy that respects people's rights may lead to less overall happiness. Philosophers have spent a lot of time coming up with arguments about why particular principles are valid or not valid, and about what to do when they conflict. Since this is just an introductory textbook, this chapter simply aims to make you familiar with these five principles so that you can recognize them and know how to apply them to situations of alleged environmental injustice. It will be up to you to decide which principles are most important. Figure 2: A Happiness-Based Solution. 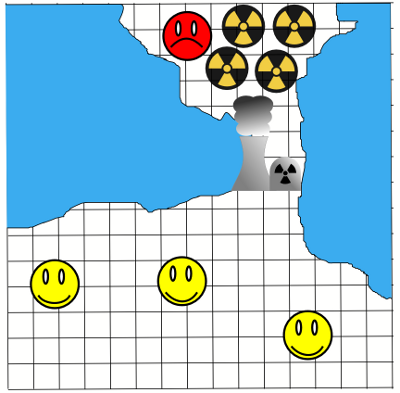 Dumping all of the waste generated by the nuclear plant in the sparsely populated area may create the greatest happiness for the greatest number, because only one person is affected. 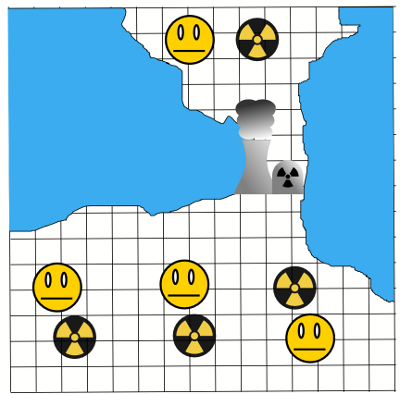 In order to clarify the differences among these perspectives, we can use as an example the case of a county deciding which of several communities a nuclear waste dump would be located in. This dump will be state-of-the-art, but even the best technology available will result in some health risk to neighbors. We will assume for the sake of simplicity that the waste has already been created (so it has to be stored somewhere), and that any alternative to a dump (say, incineration) would be equally risky and undesirable to neighbors. Many philosophers have argued that what makes something unjust is if it decreases people's happiness (Sinnott-Armstrong 2006). Gifford Pinchot, the first chief of the US Forest Service, summarized this principle by stating that natural resources should be managed for "the greatest good for the greatest number for the longest time." In the waste dump siting case, someone interested in happiness would want to look at how much unhappiness would be created by each potential location. Since each person's happiness counts equally, we would generally prefer to put the waste in a place where as few people as possible would be affected -- it's better for three people to get cancer from a leak than a hundred people (Figure 2). We might also argue that the dump is likely to pose a greater per-capita hazard to certain communities -- say, those who are poor and therefore have more precarious health already, or those who have larger numbers of young children. Finally, we may argue that some form of compensation, such as cash payments, jobs, or investment in social services like parks and hospitals, could offset some of the harms to the host community. This would be the case if the happiness that taxpayers lose by paying for the compensation is less than the happiness the compensation recipients get from it. Figure 3: A Rights-Based Solution. The inhabitants of the sparsely-populated area have a right not to have waste dumped near them -- unless everyone else gives them enough money that they consent to it. We may also hold that people have inalienable rights not to be interfered with without their consent (Wenar 2007). Under this principle, I may not violate your rights (by causing you physical harm, or taking your property) for any reason, no matter how great the gains for society as a whole, unless you agree to it. There is much disagreement about what particular rights people have. Members of the environmental justice movement often argue that people should have a right to a clean environment, but not everyone agrees. In our waste siting case, rights-based arguments seem to go two ways. People who create LULUs often use such arguments to defend themselves. They say that they have a right to put whatever sort of facilities they want on their own property, and that it is a violation of their rights to force them to locate in a different place or run their business in a different way. However, someone concerned about rights would also hold that at a high enough level of risk, a LULU is now potentially infringing on its neighbors' rights (by making them sick, reducing their property values, etc.). Thus, they would hold that a risky waste dump cannot be located in any neighborhood unless the residents all give their consent to the risk. In most cases, to get someone to consent to bear a risk, you have to offer them something else in trade. So we might suggest that the various potential sites in the county should make each other offers. 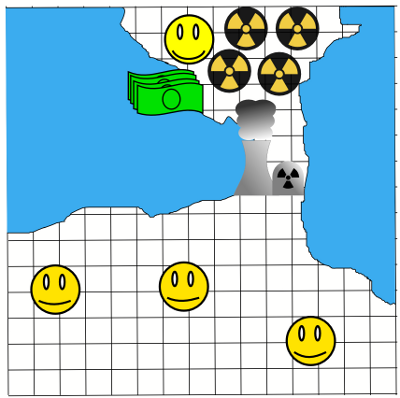 If a particular town agrees to host the waste dump, the other towns could give them some sort of payment (monetary or otherwise) so that the host town feels like it made out well in the deal (Figure 3). However, the deal would fall through if the proposed host site demanded too much of a payment. Another popular principle holds that all people should have equality of outcomes, unless there is some good justification for inequality (Gosepath 2007). For one town to bear all the risk of a waste dump would be prima facie unjust according to this principle. Figure 4: An Equality-Based Solution. Equality demands that every person who benefits from the nuclear plant should bear an equal risk from the waste. Someone primarily concerned with equality would look first to see if the towns were unequal to begin with. Perhaps one town has benefited much more than the others from the activities that produced the waste (or from some unrelated activity). If that were the case, we could argue that the town that is doing better should host the waste, leading to a situation in which all towns (or to be more precise, all townspeople) are on an equal level in the end. If the towns were equal before, then we may conclude that the only just arrangement is to build a small waste dump in every town instead of one big one (Figure 4). That way everyone is exposed to an equal, small risk. Someone who thinks equality is the most important principle might support this plan even if it resulted in a greater total risk than one large facility. Philosophers often recognize special duties that people have to one another (Jeske 2008). The kind of duties we are concerned with here arise from special relationships between people. For example, a parent has special duties toward their child. We expect a parent to make certain sacrifices to support their child economically, and to invest time in teaching their child to be a responsible adult. A random stranger who happens by does not have those same duties toward the child because they do not have a special relationship with the child. Other family relationships, like those between spouses, or between siblings, or between a godparent and godchild, contain other sorts of special duties, which may vary between cultures. We may also see non-family relationships as entailing special duties, such as between friends, or between a boss and their employee. One major source of contention around the idea of duty in the environmental justice field has to do with the duties of corporations' leaders. A common argument is that corporate managers have a duty to the company's stockholders to maximize their profits. If the company voluntarily reduces their pollution below the level required by law, this may reduce the company's profits, and thus constitute a violation of the company's duty to the stockholders. In our LULU siting example, the waste management company may cite this rationale of duty to justify selecting the most profitable site regardless of its impacts on neighbors. Townspeople who object to the decision may accuse regulators and government of failing in its special duty to protect them, or may claim that their duty to protect their children compels them to refuse to allow the dump to be located in their community. Finally, the principle of desert (pronounced with the emphasis on the second syllable) says that we should give people what they deserve or have earned (McLeod 2008). Under the principle of desert, if someone has done something good or made a contribution to society, it is justifiable for them to get more benefits. And by the same token, giving someone more harm or fewer benefits could be justified by pointing out that they did something wrong and thus deserve to suffer. Someone applying the principle of desert might argue that a rich community earned its wealth by doing work that benefits society, and therefore they deserve to be able to use it to acquire a cleaner environment. Someone else may reply that getting rich depends to a great degree on luck as well as on hard work, and therefore the poorer community does not deserve to suffer worse environmental conditions. The principle of desert also comes into play after an injustice has been identified and the wrongdoer has to be punished. Punishment of the wrongdoer and compensation of victims is usually based on the idea that the wrongdoer deserves to suffer for their crimes, and the victim deserves to be paid back for the suffering that they did not deserve to endure. Applying this principle to our LULU siting case would depend on whether any of the towns had done anything to deserve a cleaner or dirtier environment � perhaps one town created most of the waste, and therefore could be said to deserve to suffer for its role in putting the burden of disposal on the area. In the above section, we assumed that justice has to do with relationships among people. But any theory of justice has to determine what kind of things justice applies to -- some people? all people? animals? ecosystems? This issue is referred to by philosophers as considerability, that is, what beings does a theory consider to be potential victims of unjust treatment (Stone 1987). We sometimes say that considerability defines which beings have intrinsic value, and which beings have value only instrumentally. Figure 5: What interests count? An anthropocentrist would say that only the man's interests count directly. 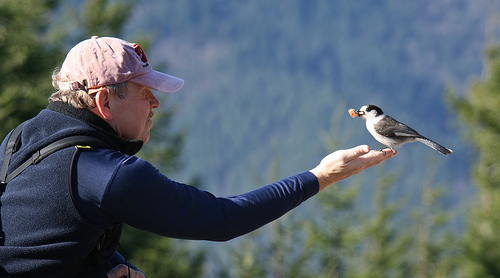 A sentience-centrist would include both the man and the bird. An ecocentrist would say that the mountain ecosystem that they are standing in has interests that should be taken into consideration too. Few people today would explicitly defend a theory of justice that holds that only some humans are considerable while others don't count. Nevertheless, debates over justice often turn on asking whether a theory that claims to treat all people equally actually does discriminate in practice against women, or immigrants, or disabled people, or some other group. In any case, a theory that limits itself to considering only humans is referred to as anthropocentric (Norton 1995). In an anthropocentric theory, non-human entities (animals, ecosystems, etc) only matter insofar as they benefit or harm humans. Thus, an anthropocentrist could advocate for saving the whales not for the whales' own sake, but because letting whales go extinct would disrupt ecosystems that human livelihoods depend on, or deprive humans of the pleasure of whale-watching. A modest alternative to anthropocentrism is sentience-centrism (Singer 1993). "Sentience" refers to the ability to feel pleasure and pain, and to care about how your life goes. A sentience-centrist believes that since some non-humans, such as the higher animals, can feel pleasure and pain, and can care about how they are treated, that considerability ought to cover them as well. A biocentrist would go even farther, arguing that all living organisms ought to be considerable, even if they cannot think or feel (Taylor 1981). An ecocentrist expands the scope of considerability to include ecosystems and landscapes in addition to individual beings (Naess 1986). For an ecocentrist, we can commit an injustice against a mountain or a river just as we could commit an injustice against a person. Some theories are hybrids. Someone may hold, for example, that relationships among humans should be judged by the principles of equality and rights, while ecosystems should be counted using the principle of happiness (Stone 1987). A wider scope of considerability may sound like a prima facie good thing. But ecocentric theories have been sharply criticized by members of the environmental justice movement. Ecocentrists often blame humanity as a whole for environmental problems, thereby ignoring the differences in access to power and responsibility within human societies (Guha 1989). And policies aiming at protecting nature from humans, like the creation of national parks or coercive sterilization programs to control population, may create social injustices. On the other hand, sensitivity to social justice need not require an anthropocentric perspective. Cesar Chavez, who led the struggle by farmworkers in the U.S. for better pay and working conditions, was also an advocate of animal rights (Chavez and Ryan 1985). And the first principle in the Principles of Environmental Justice created at a major summit of environmental justice leaders says: "Environmental Justice affirms the sacredness of Mother Earth, ecological unity and the interdependence of all species, and the right to be free from ecological destruction" (Delegates 1991). Bullard, Robert D., Paul Mohai, Robin Saha, and Beverly Wright. 2007. Toxic Wastes and Race at Twenty: 1987-2007: Grassroots Struggles to Dismantle Environmental Racism in the United States. United Church of Christ. Chavez, Cesar, and Jeri Ryan. 1985. Fighting for ideals. The Animals' Agenda. Delegates to the First National People of Color Environmental Leadership Summit. 1991. Principles of Environmental Justice. Gosepath, Steven. 2007. Equality. Stanford Encyclopedia of Philosophy. Guha, Ramachandra. 1989. Radical American environmentalism and wilderness preservation: a Third World critique. Environmental Ethics 11 (1): 71-83. Jeske, Diane. 2008. Special obligations. Stanford Encyclopedia of Philosophy. McLeod, Owen. 2008. Desert. Stanford Encyclopedia of Philosophy. Naess, Arne. 1986. The Deep Ecological movement: some philosophical aspects. Philosophical Inquiry 8 (1): 10-31. Norton, Bryan G. 1995. Why I am not a nonanthropocentrist: Callicott and the failure of monistic inherentism. Environmental Ethics 17 (4): 341-358. Singer, Peter. 1993. Practical Ethics. New York: Cambridge University Press. Sinnott-Armstrong, Walter. 2006. Consequentialism. Stanford Encyclopedia of Philosophy. Stone, Christopher D. 1987. Earth and Other Ethics: The Case for Moral Pluralism. New York: Harper and Row. Taylor, Paul W. 1981. The ethics of respect for nature. Environmental Ethics 3: 197-218. Taylor, Stephen Wallace. 2006. Citizens against wilderness: Environmentalism and the politics of marginalization in the Great Smoky Mountains. In Echoes from the Poisoned Well: Global Memories of Environmental Injustice, ed. Sylvia Hood Washington, Paul C. Rosier, and Heather Goodall, 157-169. Lanham, MD: Lexington Books. Washington, Sylvia Hood, Paul C. Rosier, and Heather Goodall, eds. 2006. Echoes from the Poisoned Well: Global Memories of Environmental Injustice. Lanham, MD: Lexington Books. Wenar, Leif. 2007. Rights. Stanford Encyclopedia of Philosophy.